Well its about that time of year again that I find myself having registered to display at a show and realised I've done nothing with lego cause all my time is spent at uni or playing guitar or riding motorbikes. Anyways for the past few years I've been building up my collection with a particular focus on small grey bits because I love castle, and I came to the realisation I now have quite a lot, so my aim for this build was to use as much of it as possible in a single creation! 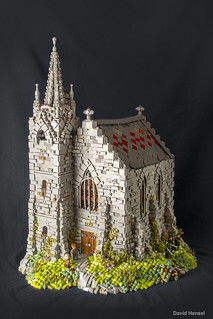 Plus I love gothic churches, I've always wanted to build one. If anyones in Wellington for Brickcon NZ on June 2-3, check it out along side some of my older creations!